President Benigno Aquino III has declared January 11, which falls on a Monday, a special (non-working) day in the City of Koronadal in celebration of its 76th Foundation Anniversary and 16th Hinugyaw Festival. The Chief Executive issued the declaration, through Proclamation 1187 signed by Executive Secretary Paquito Ochoa Jr. on December 28, 2015, to give the people of Koronadal the full opportunity to celebrate and participate in the occasion with appropriate ceremonies. Municipal Council Resolution No. 32, was passed mandating and proclaiming January 10 of each year as the Municipal Town Fiesta commemorating the foundation of Marbel Settlement District of the National Land Settlement Administration. 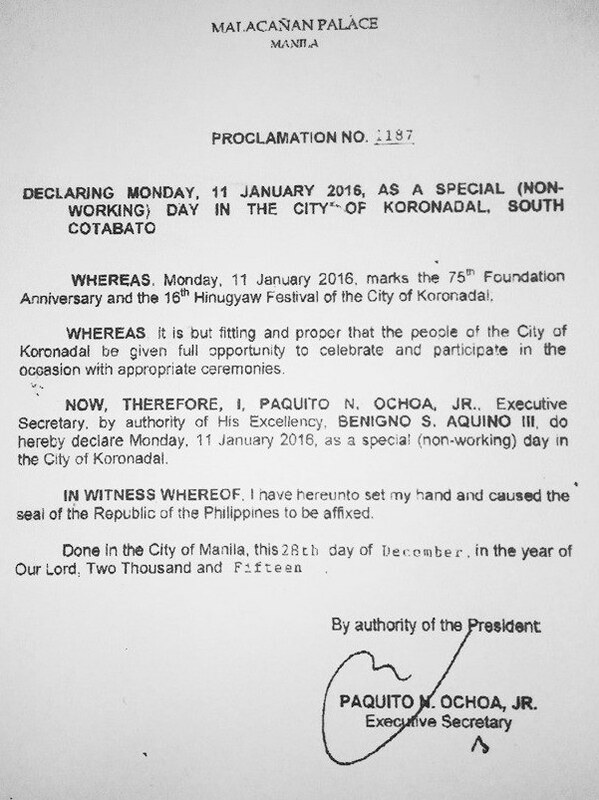 Below is Proclamation 1187 declaring January 11, 2016 as a special (non-working) day in Koronadal City.